It was freezing this January. Many days touched -20 Celsius. I get it, it’s winter, and it was a great reason to layer up. Let’s take a look at how I started the new year. This outfit was inspired by @pleatsandpatina who wore a similar rig. His jacket was a heavier tweed, and he went with a denim shirt and bottle green grenadine grossa. 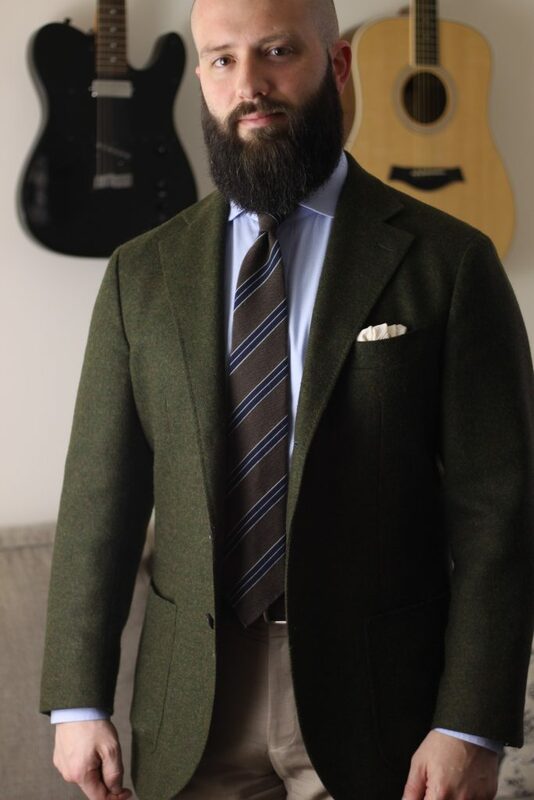 What struck me was how well the green tie paired with the blue and grey in the jacket. Conceptually, I get it, but it was really pleasing to take in. 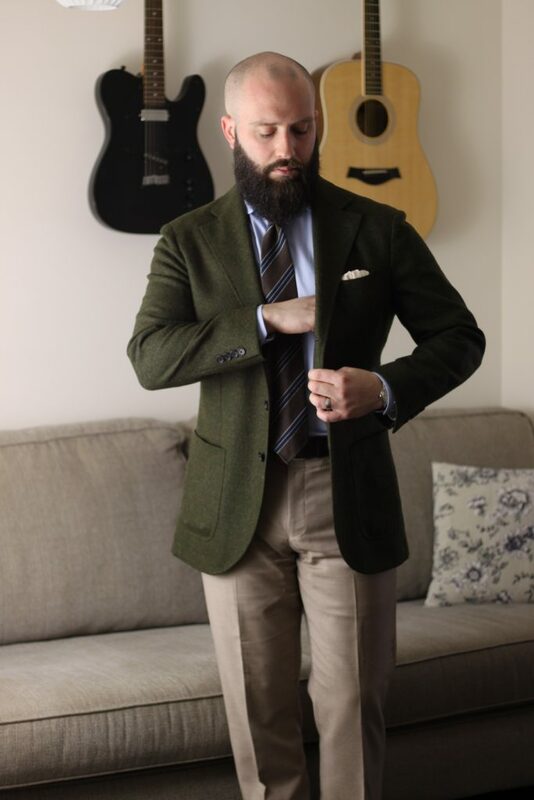 My take features a lighter weight jacket in a worsted fabric from Angelico that also adds a brown into the mix. 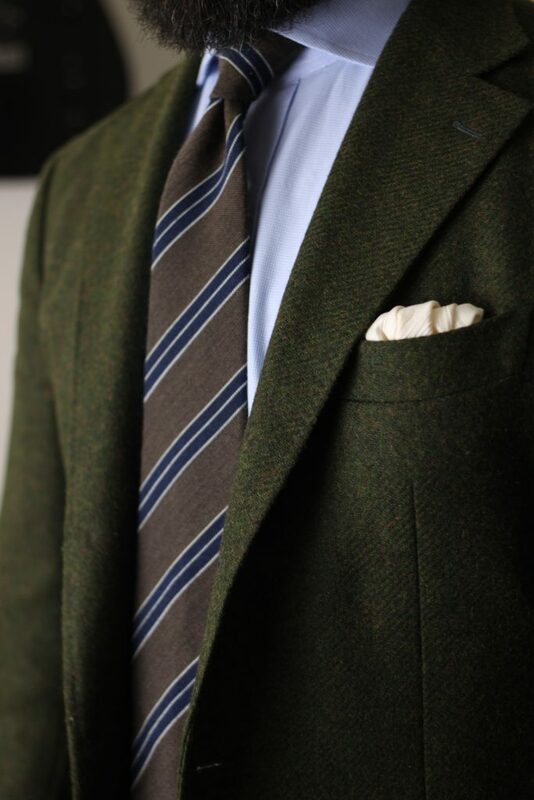 This adds a warmth that helps connect the jacket to this green tie. To change it up a bit more, I chose a chambray shirt – first cousin to the denim dress shirt. In my pocket is my St. George and the Dragon pocket square from Rampley & Co. The greens, blues and browns add some continuity without being overly matchy. 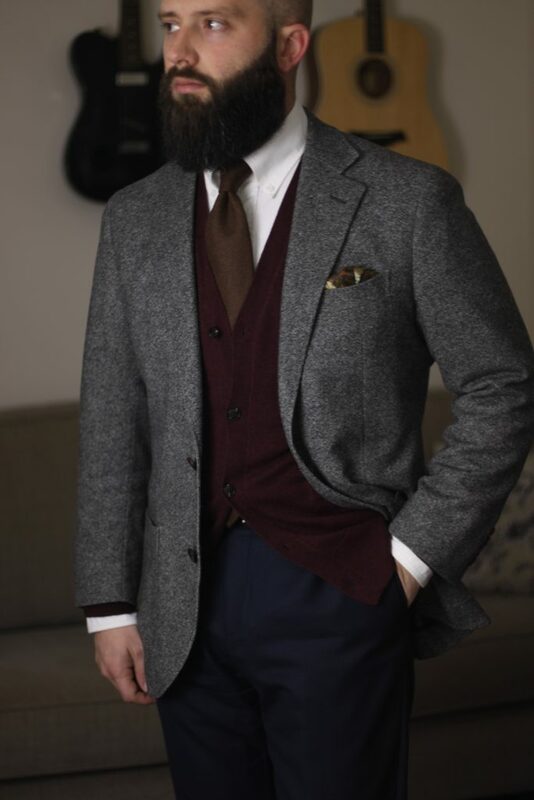 Mid brown tweed trousers complete the look. 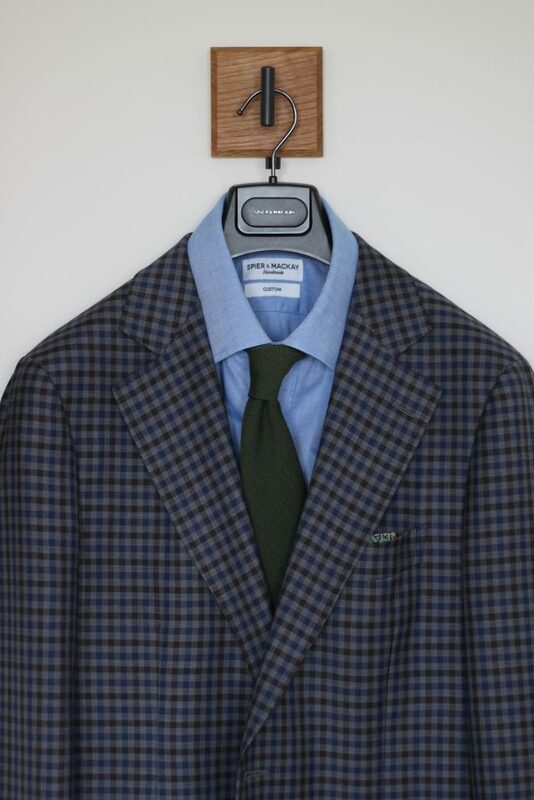 A perennial favourite, this guncheck tweed from Abraham Moon & Sons is such a killer fabric. Made up in Spier & Mackay’s Neapolitan cut, which is really well suited to the aesthetic. Last year I wore a similar pairing, but I think this execution really elevated the look. I chose my merlot crunchy knit tie from Oxford Rowe, my ecru shirt and a pair of mid-grey flannel trousers. The last go around, my choices were a little incoherent – sharkskin trousers and a grenadine fina tie. 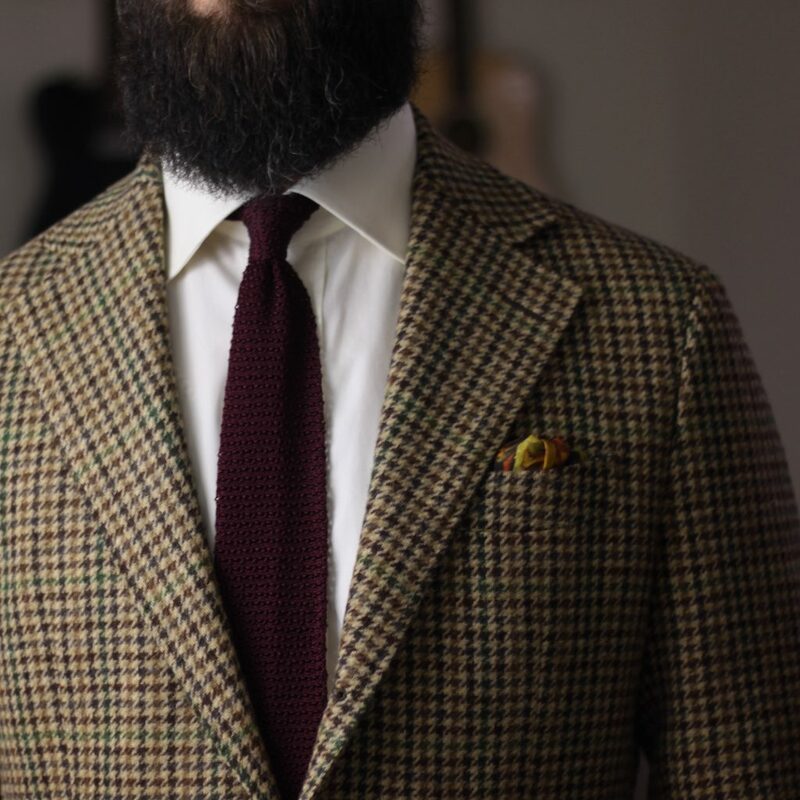 The textures were non-existent, or not robust enough to truly support the tweed. No so this time. For the second time in January, what I wore was based on an outfit I’d seen on Instagram. This one was inspired by @danielmessana, who if you’re not following, you should be. 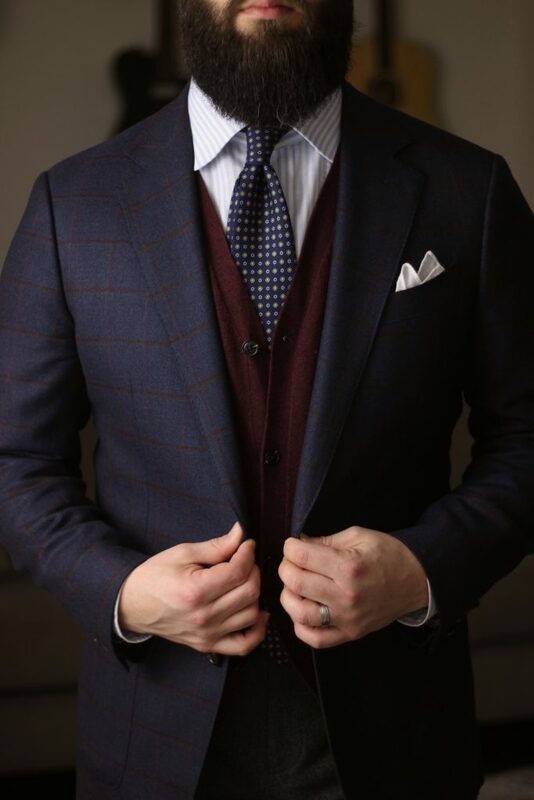 Darker tones abide, with the light striped shirt and simple white pocket square providing the only real contrast. While similar in colour and overall composition, my outfit was decidedly more formal. 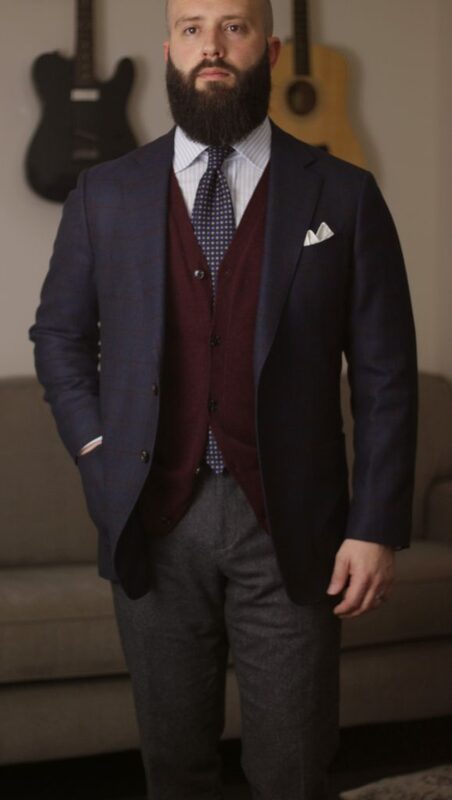 The subtler pattern of the jacket, deeper burgundy cardigan and the light blue striped shirt all seem skew away from the casual end of the spectrum. One of my favourite things about the friends I’ve made on Instagram is the interactions like this. Interesting discussions, sharing viewpoints and inspiration. 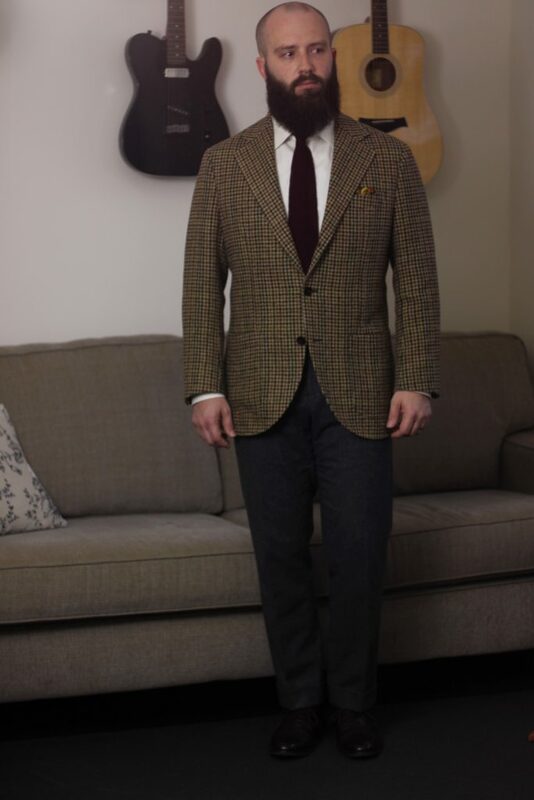 I can’t wear this sport coat enough. I love how in these photos I was able to accurately capture the wonderful mottling of orange, rust and brown beneath the surface of the green. In this outing, I chose my houndstooth shirt, camel flannel trousers, brown and blue striped wool tie and cream pocket square – both from Vanda. 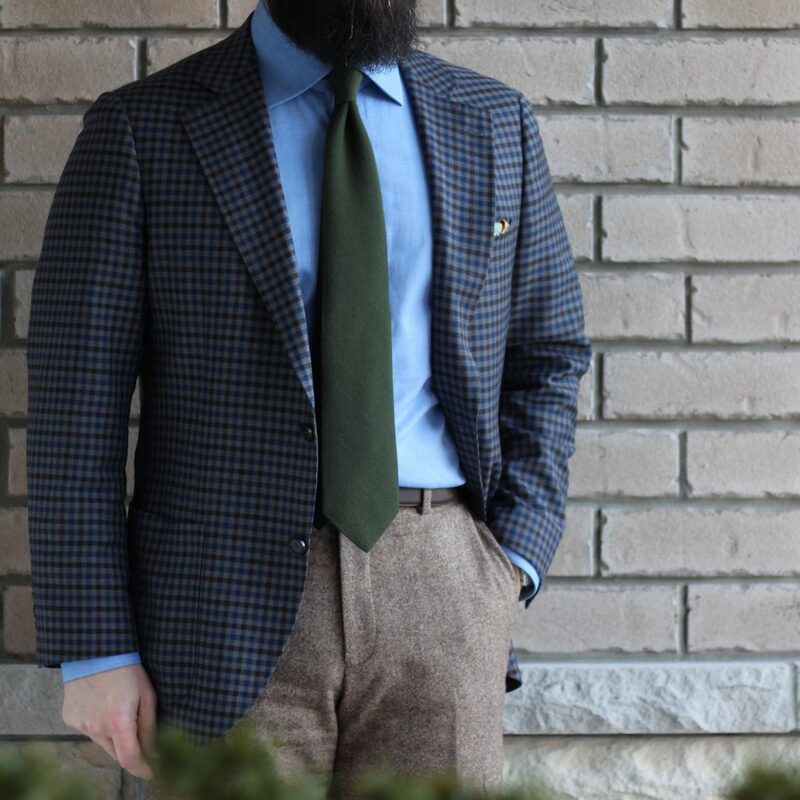 To my totally unbiased eye, this is a coherent combination – the blue in the shirt and tie add some coolness, while the camel, green, brown and cream through the rest of the outfit balance it with neutral and warmer tones. I would wear this again. Maybe next time I’ll tag in my Vecchio Anseatico tie. With this outfit, I was looking to challenge myself. 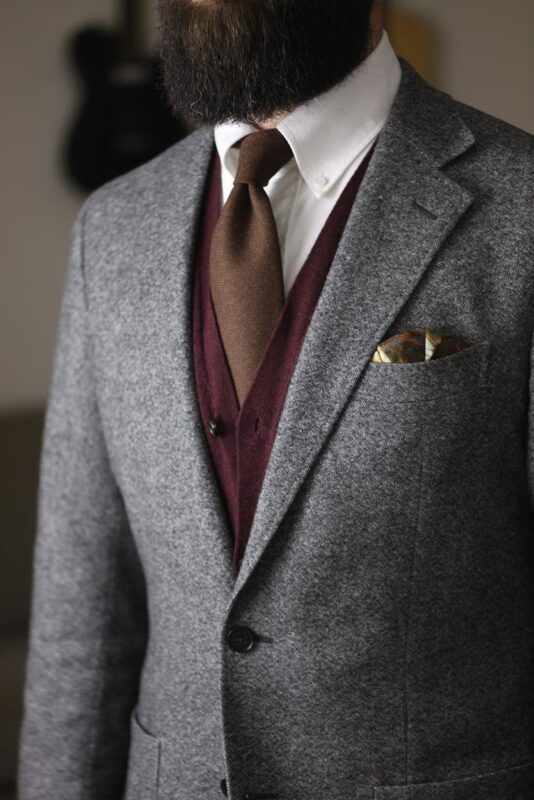 I know burgundy and brown can work well together, though they are similar. Usually, to make it work you need to add some contrast – a lighter brown with burgundy, or a lighter burgundy with a dark brown. This new tie from Rampley & Co is a fantastic shade of brown cashmere. 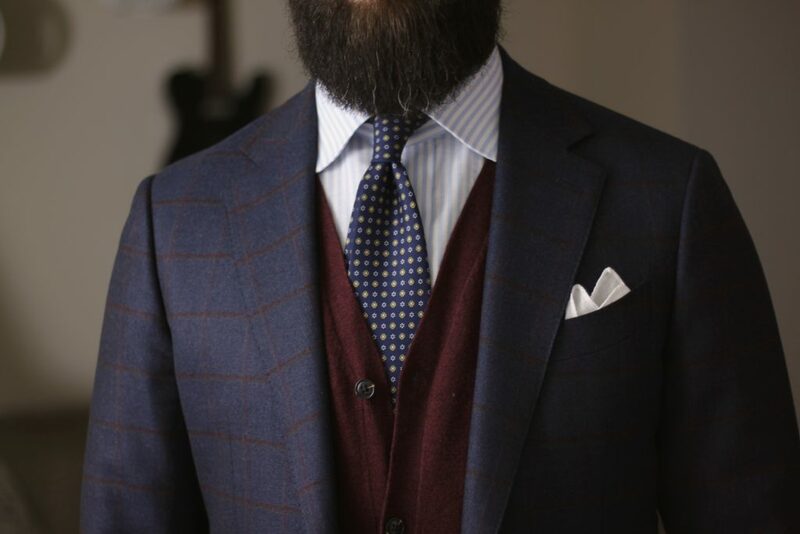 But in terms of tone and saturation, it is similar to the burgundy cardigan. To my eye, it is ever so slightly jarring, but pleasing at the same time. Navy trousers might not have been the ideal choice, but neither do I dislike them. The white OCBD might have been improved upon with a light blue striped OCBD, but I like how it looks. 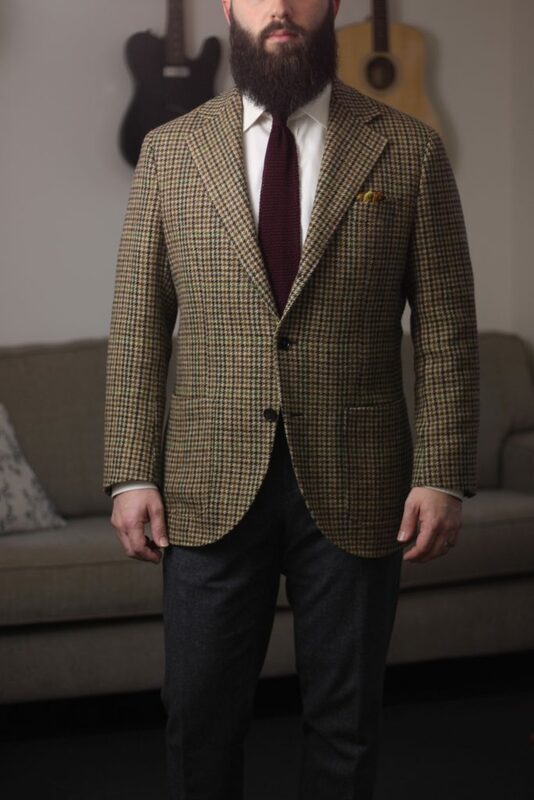 Grey tweed jacket and the Battle of Trafalgar pocket square (also from Rampley & Co) finish off the look. That’s all she wrote for the first month of 2019. Next month I’ll have to take some time to reflect on the first year of this blog. I hope you’ll join me.